To produce more and the best quality, the company uses accurate and reliable technology by partners Codema Systems Group, Hoogendoorn Growth Management and Industrial Product Solutions B.V. In the video Mr. Zhu explains how automation has enabled his company to produce safe organic leafy vegetables in a sustainable and profitable way. Watch this new video now. Feeding China, one of the worlds’ largest countries is a challenge, but securing its safety is an even bigger challenge. Promoting healthy food in China and boosting consumer confidence is thus essential, particularly in local produced food. According to Mr. Zhu, owner of Lüwochuan farm, it is especially important as local green vegetables could not always be trusted to guarantee consumer health. Mr. Ben Zhu, was running his own plastic factory for about 28 years. 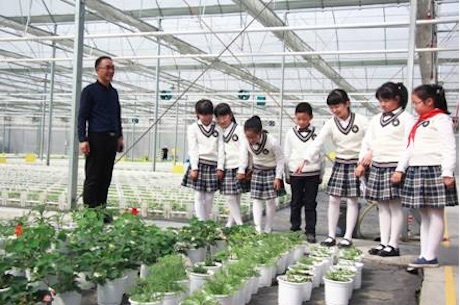 But in 2010 he started his own greenhouse project called Lüwochuan farm. This is a 2 hectare automated high-tech plastic greenhouse. Mr. Zhu partnered with André van der Stoel, owner of Industrial Product Solutions, who is a co-creator of this project and designer of the greenhouse. The aim is to enable all Chinese citizens to enjoy their fresh organic leafy vegetables. To bring healthy organic food to the Chinese consumer, Lüwochuan recently opened its own exclusive store, besides delivering to supermarkets, where Chinese consumers can taste and buy their products. On top of that, Lüwochuan organizes educational tours for e.g. schools, other growers and consumers.